From this tutorial you’ll learn how to add content using Slider JetElements module for Elementor. Use navigation? — enable the option in order to turn on navigation arrows for the slider. 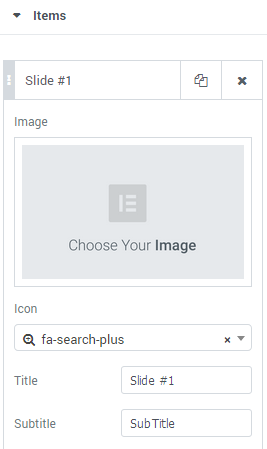 Arrows Fade on Hover — here you need to enable the option if you want the arrows to fade in on hover. Use autoplay? — enable this option if you need the slides to switch from one to another automatically. Autoplay delay — here you can set the delay in autoplay in the ms. Display fullscreen button? — here you can enable the fullscreen button. Slides shuffle — here you can enable shuffling the slides randomly. Indicates the slides will be looped — here you can enable repeating of the slides. Use fade effect? — enable this option if you want the slides to fade when switching. Between Slides Distance — define the distance to use between slides in this field. Slide Duration — here you can specify the duration of the slides in ms. Display thumbnails? — turn the option on to enable slides thumbnails. Thumbnail width — here you can specify the width of the slides thumbnails in px. Thumbnail height — here you can specify the height of the slides thumbnails in px. Primary Button URL — here you can specify the URL link for the primary slider button. Primary Button Text — here you can define the primary button text for the link. Secondary Button URL — here you can specify the URL link for the secondary slider button. Secondary Button Text — here you can define the secondary button text for the link.